There are currently around 60 resident mares on the stud that are boarded here throughout the year. Whitsbury Manor Stud owns approximately half of these mares, however, the other half are boarded permanently by a variety of private clients. These clients vary between small owner-breeders with just one mare to truly commercial breeders with nine mares of their own. All of our clients benefit from the superb boarding facilities and the stud’s decades of experience in the management of mares. We also offer a significant concession in the boarding fees of permanent mares. The stud itself consists of over 550 acres of secure post and rail paddocks situated on the chalk of the Hampshire Downs which provides exceptional drainage and is ideal for ensuring good bone growth in developing youngstock. There are 150 stables separated between 5 different yards. The facilities include a yard for maiden and barren mares which consists of two barns, a horse walker and dry all-weather wood chip paddocks for winter turn-outs. There is also a separate isolation yard of 18 boxes in order that we can provide the complete spectrum of services in managing the interests of our clients. 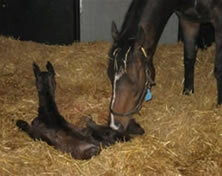 Pinkham Equine Resident veterinary service at Whitsbury Manor Stud, with on site Laboratory. Charlie Pinkham graduated from Liverpool University in 2005. He has worked for Greenwood Ellis and Partners, who built and established the Newmarket Equine Hospital. During his time there he worked on a number of large stud farms around Newmarket. In all he spent 5 years in all aspects of Newmarket stud life including organising the Newmarket Equine Hospital Discussion Group and assisting with the National Stud Education programme. Whilst at the Newmarket Equine Hospital he undertook two periods working on studs in Australia. 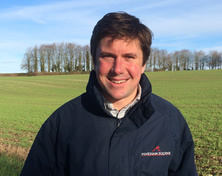 Charlie moved to Sussex to work at the Arundel Equine Hospital in 2012, then set up Pinkham Equine Veterinary Services based at Whitsbury Manor Stud in 2014. Charlie is assisted by Lucy Brock. Lucy graduated from the University of Liverpool in 2007. 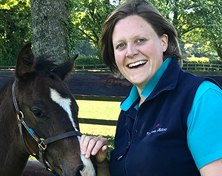 She moved to Australia and since then has shuttled between the northern and southern hemispheres working alternately for two world leading equine hospitals, the Newmarket Equine Hospital and Scone Equine Hospital. Together, Charlie & Lucy provide a Newmarket quality veterinary service which gives each visiting mare the best chance of getting in foal.